Every now and then a celebrity will allow us a peek into their homes so that they can show off their new born babies to the world while allowing us to admire their newly decorated baby rooms. On this page you will find a collection of all the celebrity nursery pictures I have managed to come up with after hours of scouring the internet. Some of the nurseries are gorgeous, some surprisingly plain. Some have celebrity written all over them. Let's start with the famous J. Lo Twins boudoir. Emme and Max started life the way their parents intend it to continue - in the lap of luxury! 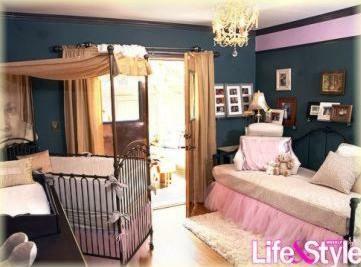 Jessica Alba created a pink baby room without the frills for her new baby girl. This celebrity baby nursery is an interesting mix of modern decor offset by vintage accents. It's different, and restrained and I love the nursery works Aerial Crib and Platform Dresser. Christina Aguilera went with a celestial fantasyland creation for her little boy, Max. 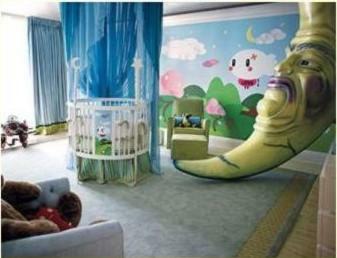 This baby room is unique in that it includes an 11 ft. tall moon used in one of Christina's tours! The nursery features a custom created round crib from All Things Creative, painted to match the Nintendo nursery wall murals. Samantha Harris shares another pink celebrity baby nursery with the world. This one was designed for her daughter Josselyn Sydney. 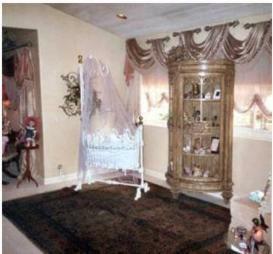 It's a shabby mod chic nursery design with an understated ballerina theme. Mom and Dad's initials are carved on the tree giving the room a unique twist. Don't you just love that beautiful Chelsea Sleigh Bratt Decor Crib! 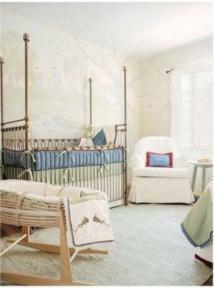 I love the crib canopy in this baby room which is one of my favorites! The canopied bed is a beautiful Dynasty Baby Cradle by Corsican. Other than that what can I say - scary stuff! 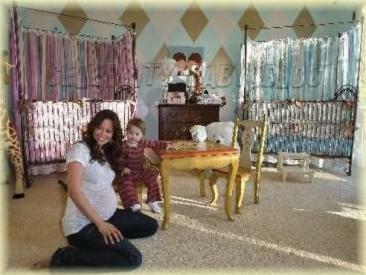 Constance Marie of the George Lopez Show created a green celebrity baby nursery for her miracle baby, Luna. 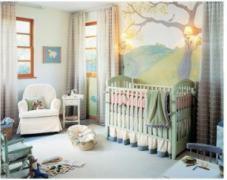 This whimsical nursery is outfitted with organic crib bedding, an eco-friendly crib and non-toxic paint. 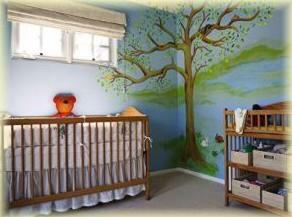 Don't you love that beautiful nursery mural? Tori Spelling took her love of pink to the next level for her new daughter, Stella Doreen, as these nursery pictures show. 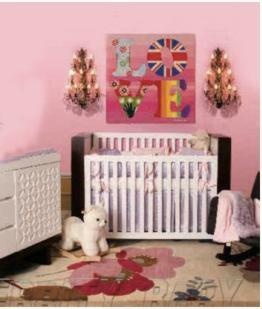 This is one unashamedly girly celebrity baby nursery! 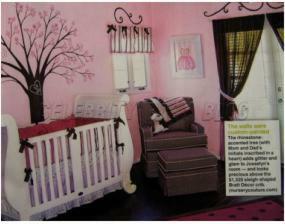 Actress and model Brooke Burke had this shabby chic nursery designed for her daughter Rain. Jeri Ryan shows us nursery pictures of the simple, sophisticated baby room she created for her daughter Giselle Lynn. Decorated in serene creams and greens, the only splurge in this nursery is the gorgeous canopy Venetian iron crib by Bratt Decor. Dianne Farr went with an understated ballerina themed nursery for her twins. 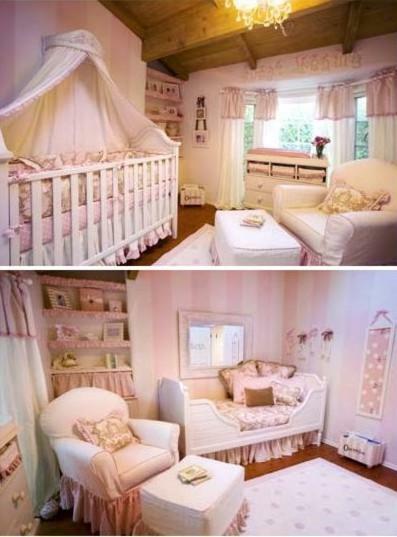 Notice the crib and bed skirts designed to look like tutus - aren't they gorgeous. Dianne also chose the Bratt Decor Venetian iron crib in gold. Are you beginning to notice a trend here? Teri Polo's nursery features the High Post Iron Dream Baby Crib by Corsican. Kelly Ripa's Fairytale Nursery features another Corsican Iron Crib. And here are a few more celebrity baby nursery rooms thankfully with different types of cribs - I do love the iron cribs but we don't want to see them in all the celeb baby pads do we? 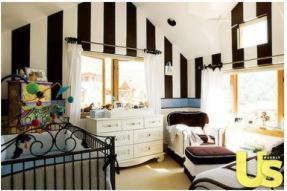 Country music star Josh Turner chose this puppy love nursery design for his son. Everything coordinates perfectly in pale blues and caramels right down to the Jenny Lind Crib. Alex Kingston's beautiful English woodlands nursery. 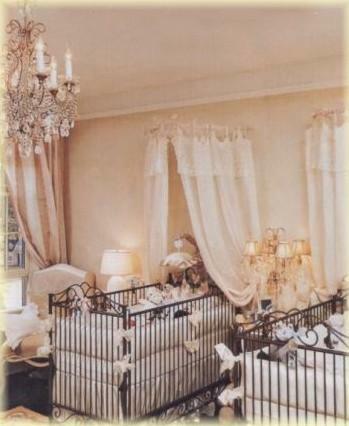 Another one of my favorite celebrity baby rooms. Nicole Kidman's modern in orange nursery for her daughter Sunday Rose. And last but not least, a step back in time to 1958 and a black and white nursery photo of Jayne Mansfield's celebrity baby nursery. I hope you enjoyed looking at these celebrity baby nursery pictures. 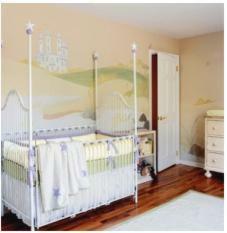 Many of these baby rooms were designed by top nursery design consultants. 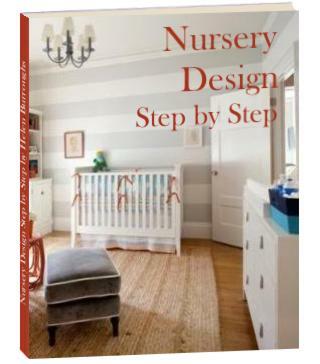 Hopefully they have given you some nursery ideas for your little one's room. If you want to create a nursery for your little one based around the ideas in these nursery pictures, you will need to some gorgeous designer nursery decor. It's the place where all the stars love to shop!